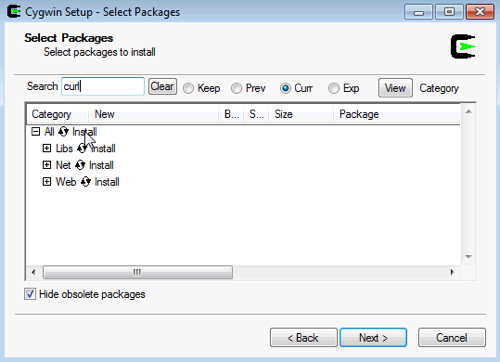 This post might also be called, “How to Install Cygwin for Use With Open Hosting’s API…” Cygwin is a Unix-like environment and command-line interface for Microsoft Windows. And, it is the easiest path to our API from a Windows machine. A correctly installed and configured Cygwin will allow you to exercise the entire API library just as easily from Windows as from Linux or OSX. There are three parts to this tutorial: installing Cygwin, installing the API scripts, and configuring a Cygwin session to connect with the API. 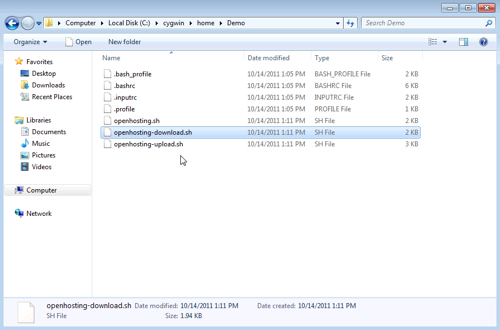 Visit http://cygwin.com/install.html and download setup.exe. Then click “next” and accept all the defaults until it starts installing. Finally, if Windows bothers to ask if Cygwin was installed correctly, please insist it was indeed. Cygwin and cURL are now installed. Next, we’ll download the API scripts and make them executable. Now, start Cygwin and confirm that the scripts are located in your home directory by typing ls. You’re now ready to interact with the Open Hosting API. For the duration of your Cygwin session, all of the Open Hosting API commands are available.